The Guinness Collection was assembled by the Hon. Desmond Guinness and his first wife, the late Mariga Guinness, in the 1960s. The core of the collection relates to architectural projects undertaken in the mid- to late-eighteenth century by various members of the FitzGerald family, Earls of Kildare and later Dukes of Leinster. Included are works by Isaac Ware, Thomas Ivory and Thomas Owen. Particularly noteworthy are the original drawings by Richard Castle for Leinster House in Dublin. Castle’s elevations for Leinster House in particular demonstrate the high Neo-Palladian classical refinement demanded from the architect by his exacting client, James FitzGerald twentieth Earl of Kildare and later first Duke of Leinster. One of a number of surviving designs for the front elevation. These drawings were originally housed as a collection at Carton, the FitzGerald seat in Co. Kildare, and were later moved to the Leinster Estate Office at 13 Lower Dominick Street, Dublin. Here they remained undisturbed until 1958 when 13 Dominick Street was demolished. This was the same year that Desmond and Mariga, responding to increasing public unease over the destruction of Ireland’s built heritage, re-founded the Irish Georgian Society. 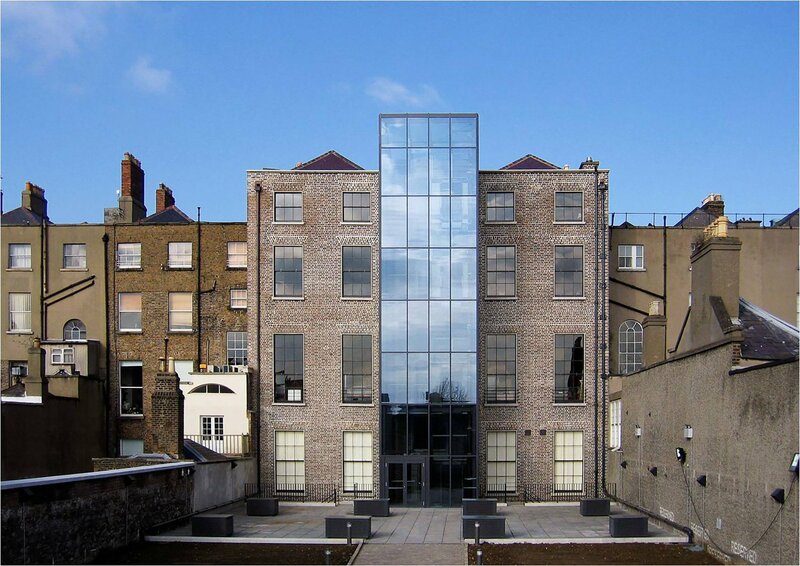 While the Guinnesses were unable to save 13 Dominick Street, they were at least able to rescue the drawings from the doomed building and the acquisition of this remarkable collection spurred the couple on to build what would become the most important collection of Irish architectural drawings in private hands. A second set of drawings in the collection came from Headfort, Co. Meath, seat of the Marquis of Headfort. 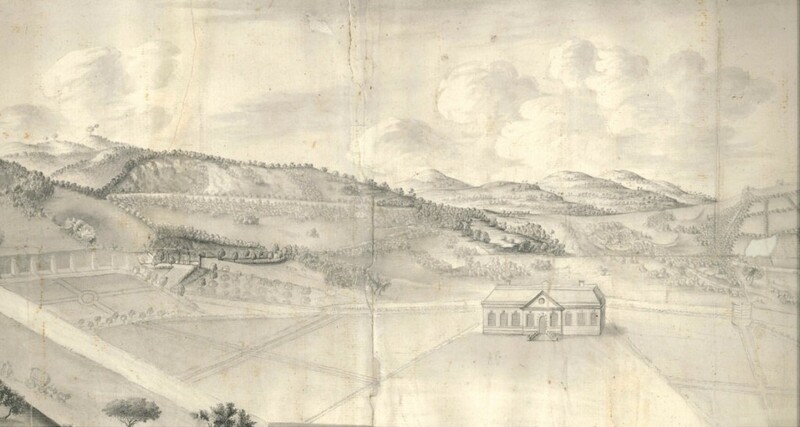 This part of the collection includes designs for Headfort itself, and other buildings on the Headfort or Bective demesne, by Richard Castle, John Aheron, George Semple and Thomas Cooley. 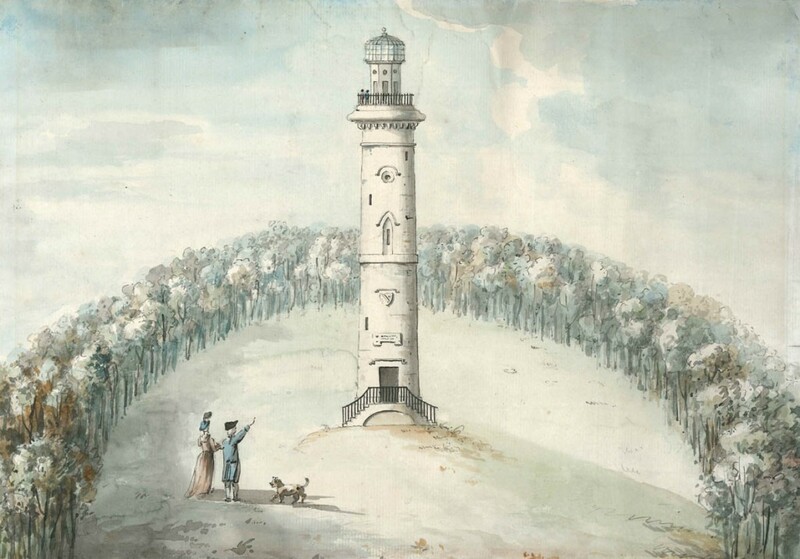 Classical architecture is again well represented, but so too is more playful or curious side of architecture with drawings for a Chinese garden temple or the magnificent folly that is Lloyd’s Tower. This drawing shows the gates as executed. 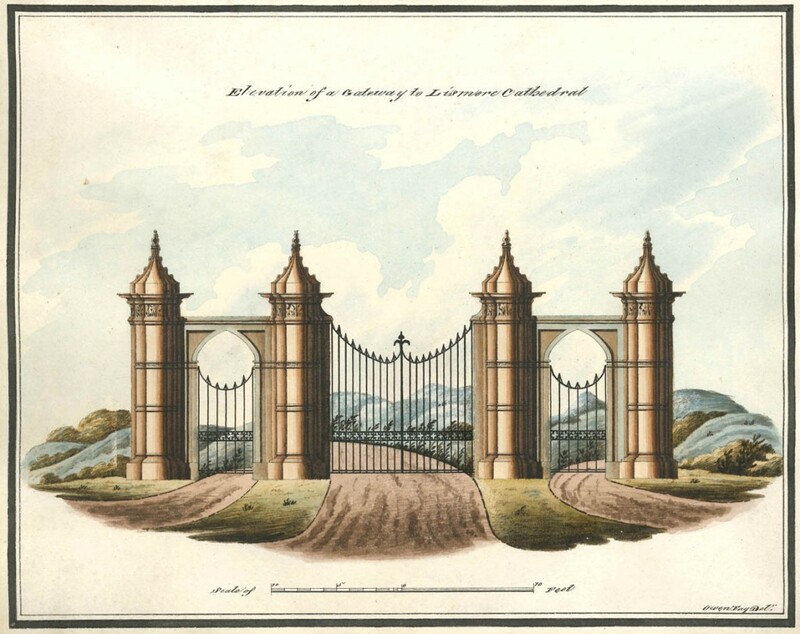 It is probable that Richard Morrison was the actual designer of the gates. While many of the drawings in the collection were snatched from the jaws of destruction, Desmond and Mariga also acquired material in more conventional ways. 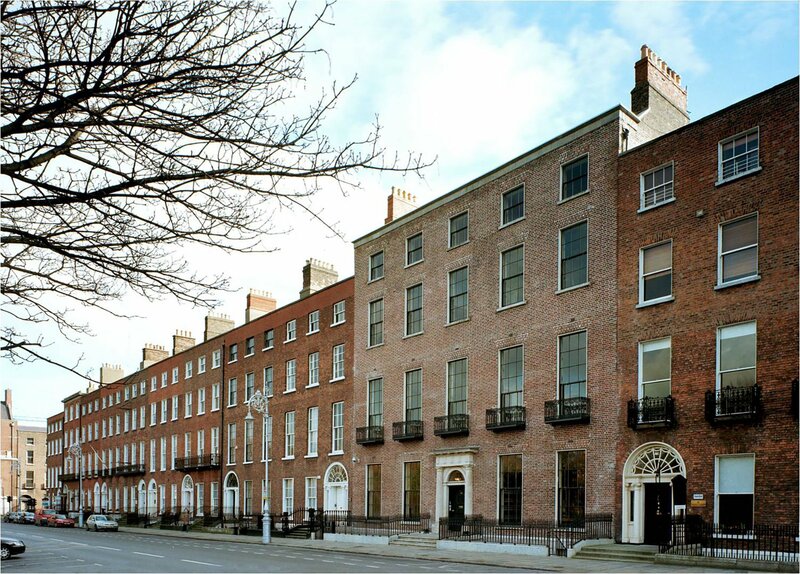 The Doneraile drawings for 45 Kildare Street, the earliest surviving designs for a Dublin terraced house, were acquired at public auction. Also acquired at auction was material from the firm of Henry Mullins and McMahon, the leading building contractors in Ireland in the first three decades of the nineteenth century, involved largely in government work and canal construction. This part of the collection includes works by James Bell, David Henry and Owen Fay, a somewhat shadowy architectural draughtsman whose drawings are recognisable from the thickly-coloured gouache elevations, the distinctive script and the bold black border with which they are generally framed. 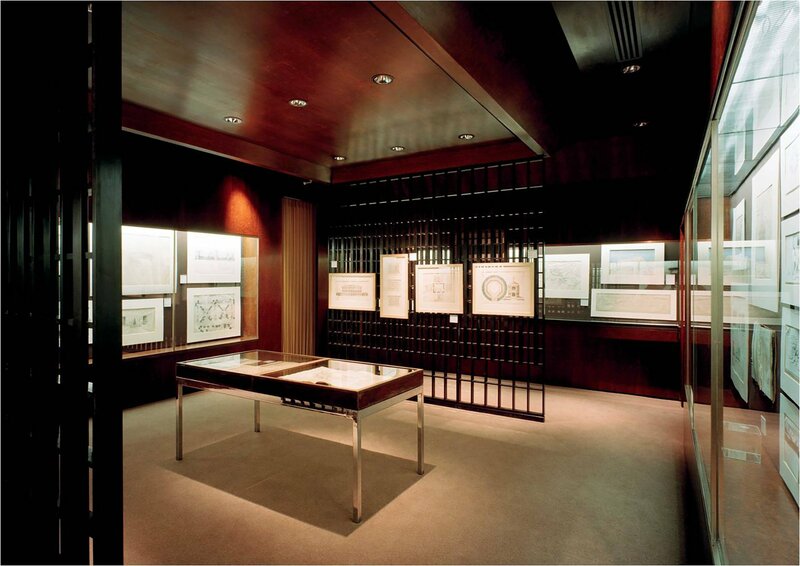 The Guinness Collection remains one of the most important bodies of architectural drawings relating to Ireland. It was acquired from Desmond Guinness by the Irish Architectural Archive in 1996 through the generosity of the Bank of Ireland Group and with the help of the Department of Arts, Heritage and the Gaeltacht.